Following the update of OneNote for iOS recently, Microsoft has now released SkyDrive for iPhone- a free iOS app allowing iPhone users to access Microsoft’s free SkyDrive cloud-based file storage service, granting Apple users with 25GB of Free Cloud Storage! This amount of free cloud-based storage actually is the most attractive offer, in comparison with other cloud storage services, despite an individual file limit of 100MB. “We realize that not everyone who relies on SkyDrive for sharing photos or accessing Office documents uses Windows Phone… yet.”- said Microsoft’s group program manager Mike Torres, announcing the release of SkyDrive App for iOS. 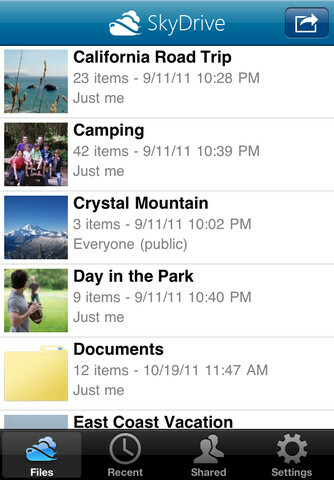 SkyDrive is a personal cloud based storage and sharing service, allowing users to organize their files, folders and other stuff and synchronize them to all their devices, now including iPhone, iPod touch, and iPad as well! • Create and delete files or folders you do not use any more. In addition to their OneNote notebooks, iPhone customers can now access all of their files in SkyDrive, create folders, delete files, and share links to folders and files directly using the Mail app. The app supports all the basic options, except the ability to see synced storage from Live Mesh, but please note that this is just a beginning! SkyDrive for iOS supports 32 languages, including: English, Bokmål, Norwegian, Catalan, Chinese, Croatian, Czech, Danish, Dutch, Finnish, French, German, Greek, Hungarian, Indonesian, Italian, Japanese, Korean and more. The App requires iOS 4.0 or later to be fully functional and is available in Apple App Store under Productivity Category for FREE. We know you love your iPhone but just in case you have been thinking about switching to Windows Phone, surely you will have the SkyDrive app there too.